Digital transformation, no-line commerce and customer experience: these are the hot topics which are keeping retailers busy. From the 27th of February to the 1st of March, the EuroCIS trade fair anticipates 10,000 visitors who want to discuss exactly these topics. While in Dusseldorf, visitors of the EuroCIS should not miss the opportunity to discover the exp37. Since October 2016, retailers from across the fashion and lifestyle industry have visited the Experience Store “exp37” to discover and experience an innovative no-line commerce journey. In the exp37 the creative- and communications agency Mavis and the consulting specialist TAILORIT as well as several renowned partners showcase an extraordinary customer experience at the POS. In addition to customer touchpoints such as interactive shopping windows, an intelligent fitting room, augmented and virtual reality, applications of operational excellence such as RFID and dynamic pricing are exhibited. “Through the high concentration of relevant technologies and digital services, the exp37 showcases a customer-centric shopping experience par excellence.” This is the feedback that the initiators frequently enjoy. The top-class visitors (30% C-Level) from across industries – from fashion and cosmetics to food retail to furniture and consumer electronics – underline the relevance of the topic no-Line commerce. Thus, the exp37 in tune with the times. 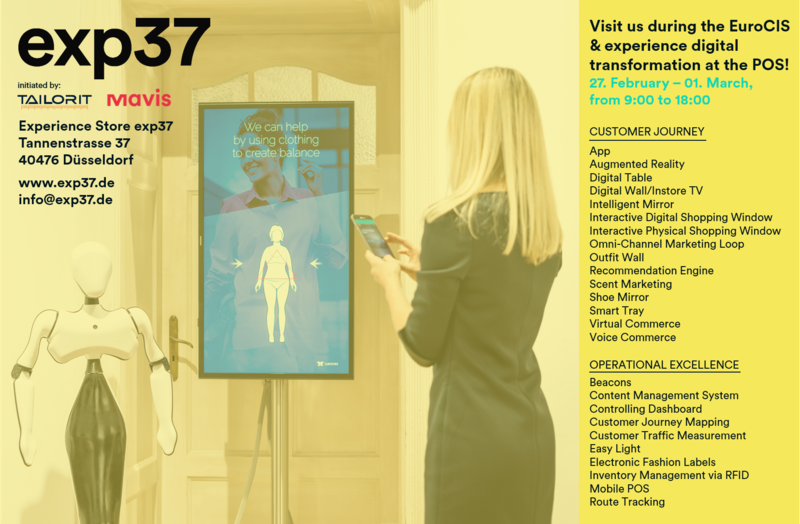 During the EuroCIS trade fair from February 27th to March 1st, the exp37 is opening its doors and inviting trade fair visitors to experience the innovative touchpoints and inform themselves about the future of retail. Retailers can visit the exp37 daily from 9.00 a.m. to 6:00 p.m. – with or without an appointment – and thus round off their trade fair visit. Through the ongoing implementation of new touchpoints and technologies, even those who have previously visited the exp37 can be newly inspired and excited. Opening hours: 27/02 – 01/03, from 9:00 a.m. to 6:00 p.m.